The red car that hit the lamp post is no longer running. Sometimes one or more dependent clauses are sandwiched between parts of the main clause. 1. 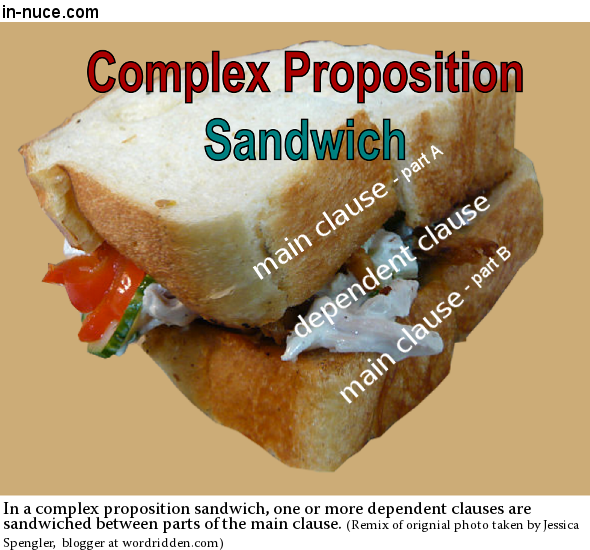 A dependent clause may be found inside a main clause in a complex principal proposition. Josh, who trained for months, ran the race well. and “who trained for months,” which is a dependent clause. Is either of these assertions an element within another? The man that does no good does harm. and “that does no good” which is a dependent clause. 2. A dependent clause may be found outside a main clause in a complex principal proposition. I will go when the spring comes. and “when the spring comes,” which is a dependent clause. Is either of these assertions an element of another? After the whistle blew we ran to the station. and “after the whistle blew,” which is a dependent clause. Tell which of the following sentences contain complex principal propositions. For each complex principal proposition, identify its main clause and its dependent clause element. Example — I hear that you have sold your farm. 1. We know that you were there. 2. The reason, which I hurriedly conveyed, was urgent. 3. The reason that they gave was insufficient. 4. I accepted the excuse which you gave. 5. We were aware of it. 6. I know when the train will start. 7. I fear that it may be late. 8. It was not then believed that the earth is round. Now select all the dependent clauses and tell how they are being used.